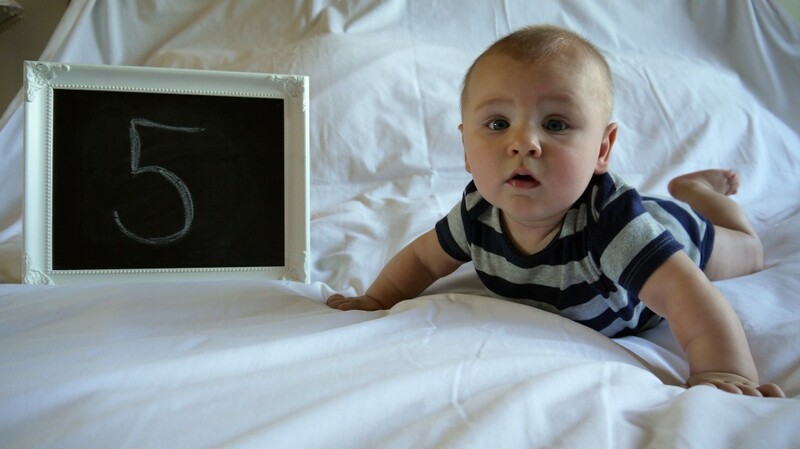 Our little man turned five months old today! It’s crazy and amazing and fun to see how much little ones change and develop in such a short amount of time. At five months, E brings a lot of joy, poop, and sanctification to my day. I don’t know what I’d do without him! Even in that moment when I’m struggling to carry 17 pounds of baby, a picnic lunch and a large bag of laundry down to the car from our second story apartment, and the little man chooses that moment to let out some major spit up all over my shoulder… I am still majorly blessed. My mother-in-law recently asked me how I though I had changed since being married, and my response -especially now that we have a child to raise- was that I believe I’ve mellowed and relaxed so much more. Those things that I made much ado about as a single pale in comparison to the ways I have to let go of expectations and personal standards as a mom, and we’re just getting started! That’s not to say that we’ve thrown cleanliness and quiet time and personal grooming out the window, but my ability to flex and adjust if those areas aren’t perfectly met (and preferably with zero complaining) is much improved. The bigger my little guy gets and more able to process mommy’s reactions to life’s happenings, the more I am humbled by my need to check my attitude over seemingly small annoyances. 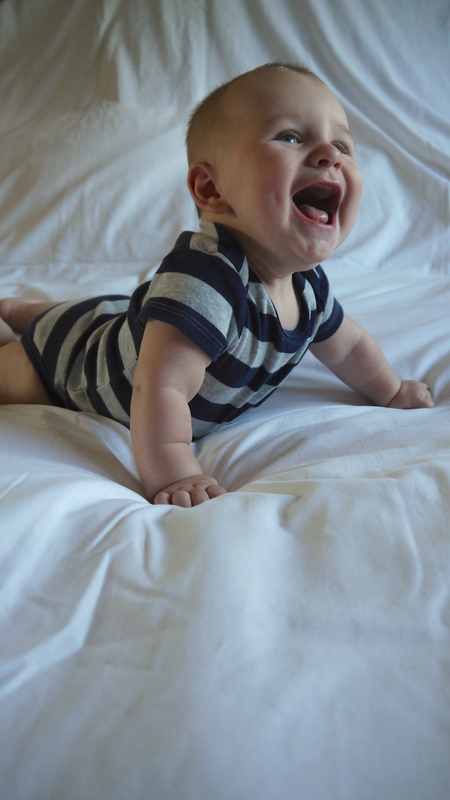 But with those confessions aside… Ethan Edward is a joy at five months and continues to bless us with his smiles, his interaction, his little goofy faces and noises. 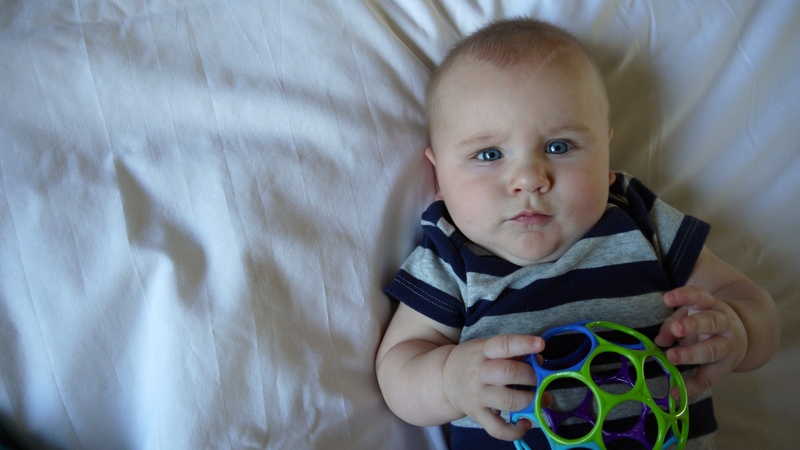 He weighs 16.8 pounds of pure irresistible chub, is in 6-9 (sometimes 12) month clothing and wears size three diapers. Crawling doesn’t seem too important yet, but he is very strong and mommy already has a hard time holding him still when he has the wiggles. He loves his “indestructible book”, his ball, anything that crinkles, and he discovered his toes, which are always good for a chew here and there. He is basically sleeping through the night now (no tears over that milestone! ), naps three times a day, and except for certain bouts of teething woes, is a fairly content and cheerful baby. 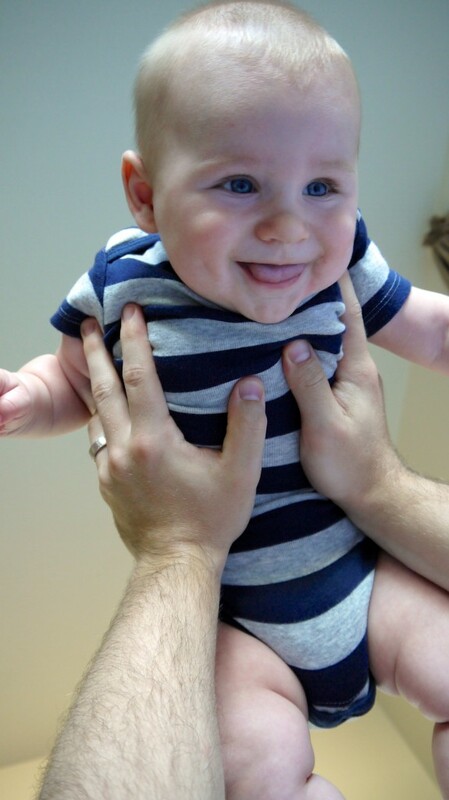 He has two teeth in already, which we discovered one epic Sunday when he was fussy, vomited all over us and the pew several times, and peed on mommy right before communion. Life with the three B’s is never dull! And how about all that training I talked about in my last update? Potty training isn’t really “going” (apart from a few good days several weeks ago), if you know what I mean… partly due to my laziness and partly due to traveling. But, I didn’t really have any expectations at this stage, though I do hope to become more dedicated around 7 months. Our biggest thing right now is the “learn-how-to-keep-mommy-sane-during-Church” project. That whole humility thing really hits hard right about halfway through the service, when my child is the one letting everyone know that he’s going on a nap strike, because, you know… my children weren’t going to be that way. But then reality hits and I realize that my son is human (like me- surprise!) and that this whole training thing won’t happen overnight. My respect and awe for my own parents having raised me and 6 other children continues to grow the longer I parent our Ethan. We’re doing pretty well at not copying him while fussing or whining, especially now as it’s getting much easier to distinguish between baby babbles and frustrated crying. 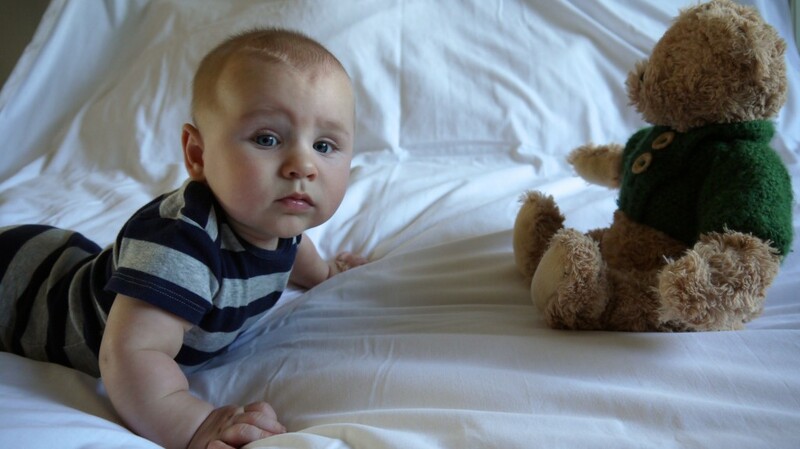 At five months I feel like he’s grown so much in his ability to communicate different things, just in tone alone. 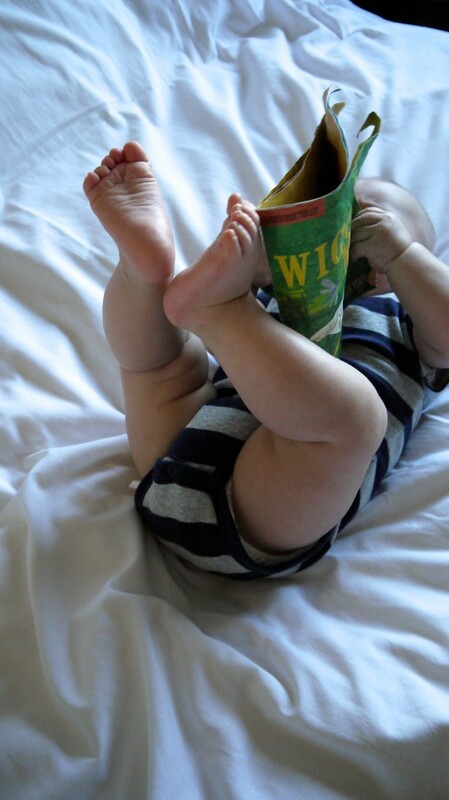 Babies are smart, which is also why I’ve started signing around him. You never know what he’s picking up mentally, and will be able to start signing as soon as he can control his hands enough to do it physically. I do continue to have bible time with him each morning, and we do it together as a family each night. I also added in having a quiet play time each afternoon, to practice sitting during Church. I listen to a podcast or audiobook while E sits on my lap with books and toys. We’re up to sitting for half an hour right now, and we’re still working on helping Ethan to not screech or arch his back in frustration, but I know consistency is the key. Our daily schedule is going very well. There were so many times during the first three months when I wondered if it was worth it, especially with what seemed like constant disruptions. But I look back and am so glad I stuck with it. We’re both so much happier to work in a daily routine, and though E is showing some signs of strong willed firstborn behavior, he doesn’t fight the schedule, and let me just say that peaceful, regular naps are pretty heavenly! 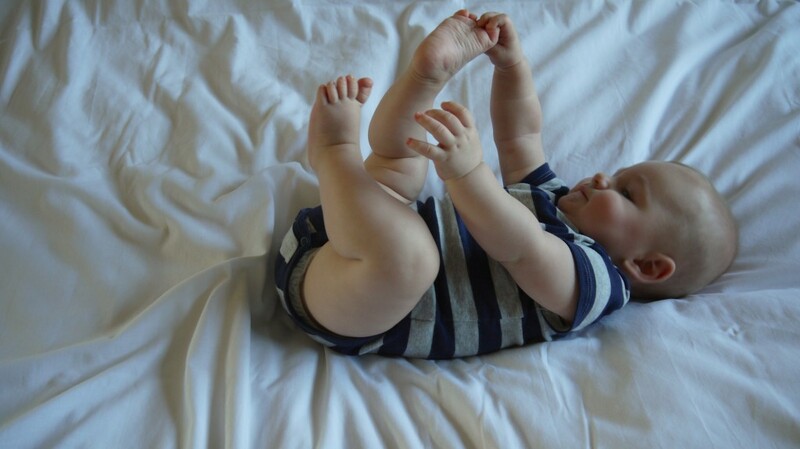 We are learning a lot as we care for our little boy. We are blessed and humbled to be his parents! Love these updates! 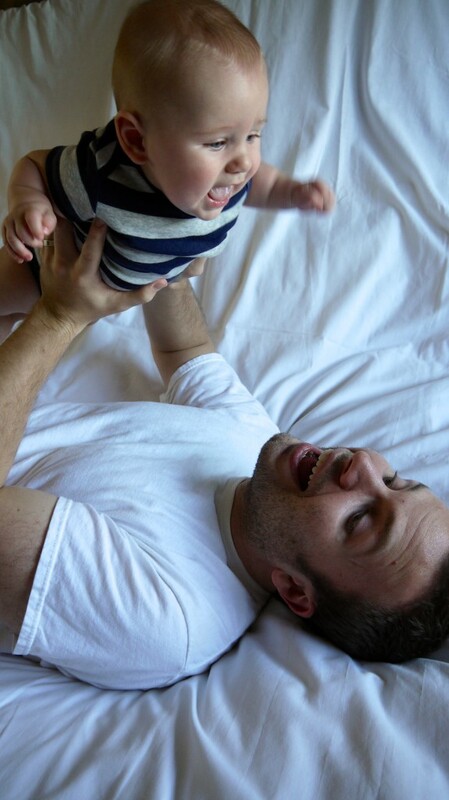 The pictures are just too precious. I can see bits of your brothers in his expression, which is fun. And I’m so glad I only have a month to wait before I finally get to cuddle your little bundle of fun in person! And yes… relaxing and letting things go so has to happen as a mom. I’m now finding it so much harder to get out the door on time – I understand now why my mom and other moms always seemed to be running late! 😉 Not to give up on trying to be punctual, but also learning to give myself and others grace. Grateful to be on this parenting journey with you!